Mama met Eric at the same workshop she’s met most of these authors but he’s also from around where her family lives so she’s gotten to hang out with him one on one discussing writing and editing and other writerly things. Although he currently has a dog, she was thrilled when he talked about this series featuring a cat and knew that the people who like cat blogs would probably love reading stories with cats. Thief of Sparks is Eric’s story in the bundle and it’s a novella. It’s also the first in the Starside Saga series, so it might just wet your appetite for more. She thought she was stealing gold to save her brother … instead she steals a key that will unlock her destiny. This novella is the first book of Starside Saga, a fantasy series filled with magic, thieves, and dire prophecy. And steal she must…For Kila Sigh is desperate to help her brother survive. But the gods have bigger plans for her. She is the flame in the night, the daughter of ravens, and the bringer of death. 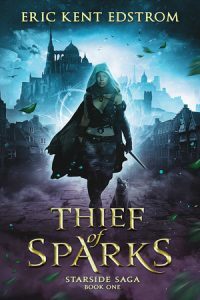 Fans of fantasy will fall in love with this world of thieves, magic, and adventure. This novella is the starting point for the epic Starside Saga. Eric is a wonderful writer and some of his stories from years ago are stories Mama remembers as favorites. Eric is the author of the science fiction and fantasy series The Undermountain Saga, The Scion Chronicles, and Starside Saga. He lives in Wisconsin with his family. You can find him at his website.